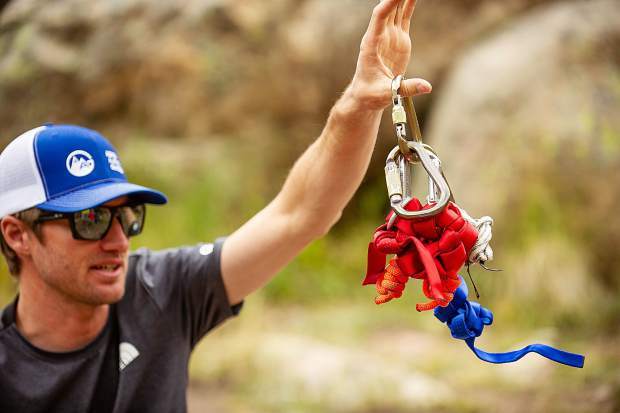 KC Nau places an anchor on a natural feature up Independence Pass with webbing on August 25 for a field planning and safety clinic with Aspen Alpine Guides. Aspen Alpine Guide Nate Rowland holds up his rack of gear he takes mountaineering for a field planning and safety clinic August 25. 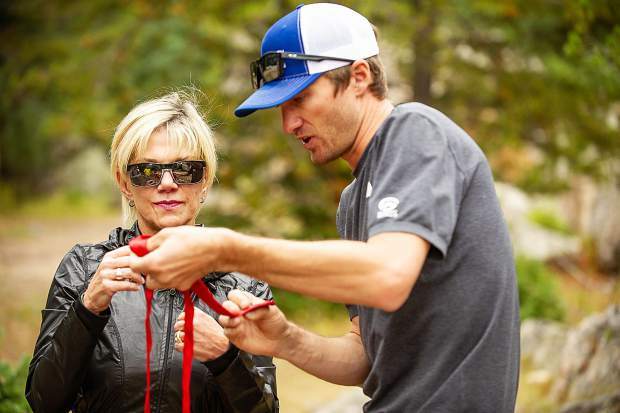 Aspen Alpine Guide Nate Rowland shows Debbie Stonecipher how to tie a water knot with webbing on August 25 for a field planning and safety clinic. 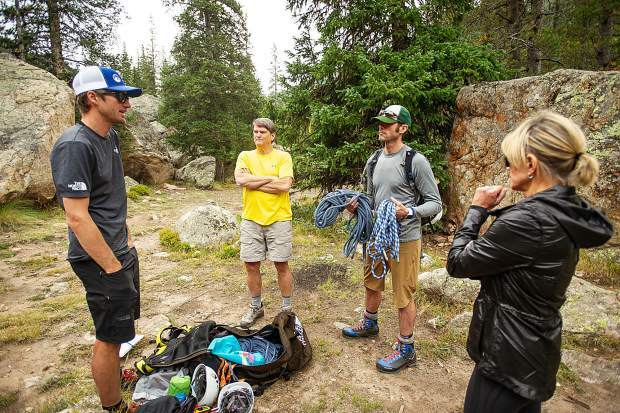 A field planning and safety clinic up Independence Pass on August 25 with KC Nau, back left, David Rubin, center, Debbie Stonecipher and Aspen Alpine Guide Nate Rowland. Aspen Alpine Guide a type of harness he takes mountaineering for a field planning and safety clinic August 25. 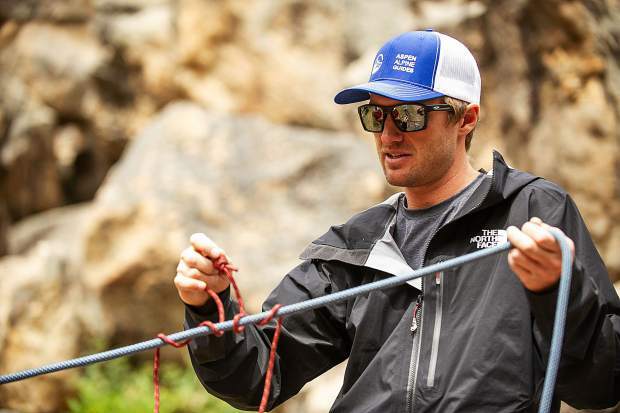 Aspen Alpine Guide Nate Rowland ties a water knot with webbing for a field planning and safety clinic August 25. Aspen Alpine Guide Nate Rowland shows David Rubin how to tie a figure 8 knot with climbing rope on August 25 for a field planning and safety clinic. Aspen Alpine Guide Nate Rowland demonstrates how to tie a prusik knot August 25 for a field planning and safety clinic up on Independence Pass. 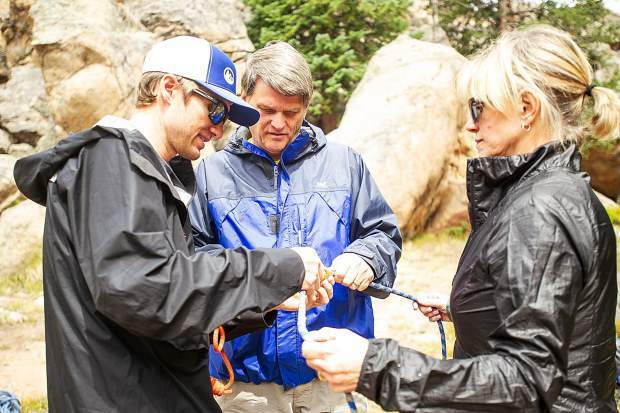 Aspen Alpine Guide Nate Rowland shows Debbie Stonecipher and KC Nau how to tie a prusik knot with rope on August 25 for a field planning and safety clinic up on Independence Pass. 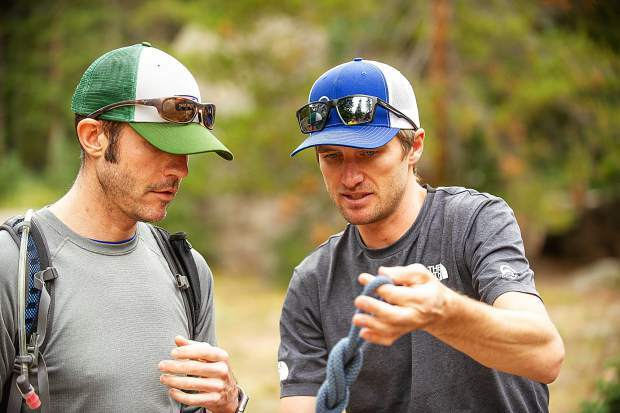 Aspen Alpine Guide Nate Rowland, right, and David Rubin demonstrate how to use natural features for mountaineering up on Independence Pass on August 25 for a field planning and safety clinic. 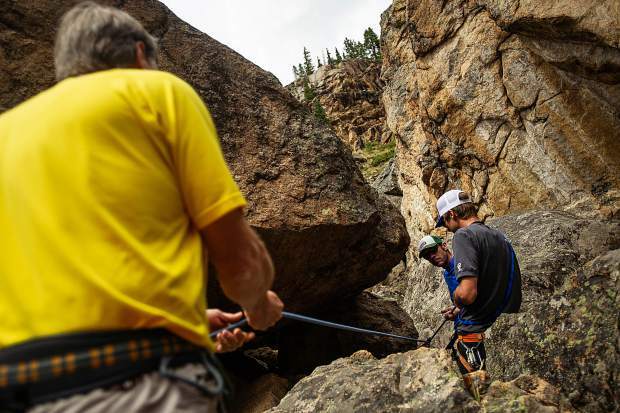 A field planning and safety clinic up Independence Pass on August 25 with KC Nau, center, David Rubin, left, and Aspen Alpine Guide Nate Rowland. 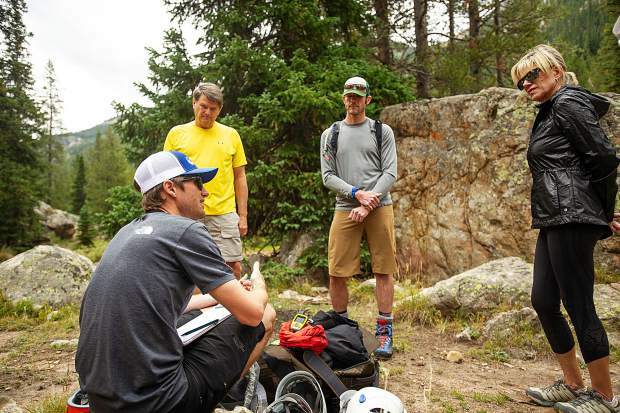 A field planning and safety clinic up Independence Pass on August 25 with KC Nau, left, David Rubin, center, and Aspen Alpine Guide Nate Rowland. 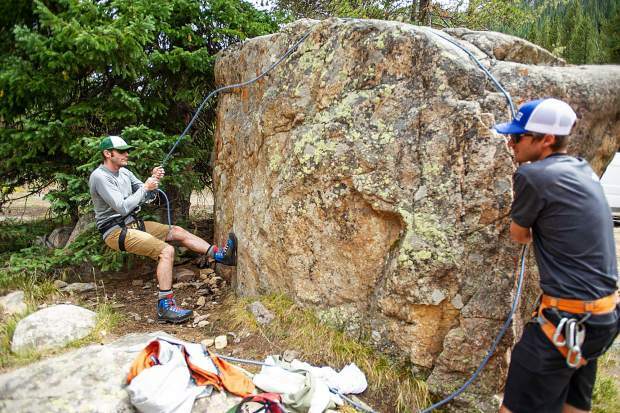 KC Nau gets his anchor checked by Aspen Alpine Guide Nate Rowland up Independence Pass on August 25 for a field planning and safety clinic. 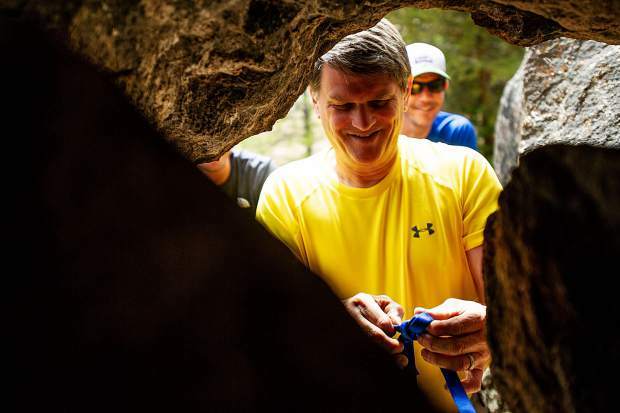 The seven deaths and scores of search-and-rescue missions on the high peaks around Aspen last summer left a significant impression on local officials who had to deal with the tragedies. 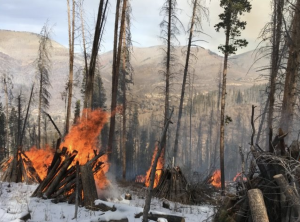 Those officials — from Mountain Rescue Aspen, the Pitkin County Sheriff’s Office and the U.S. Forest Service — resolved to do something about it this year. And so, in conjunction with two local guiding services, the Elk Range Mountain Safety Coalition was born. “The most important part of the campaign is (to publicize) what people are in for if they go out there,” said Pitkin County Sheriff Joe DiSalvo, who has called last year’s peak fatalities the worst he’s seen in more than three decades in Aspen. 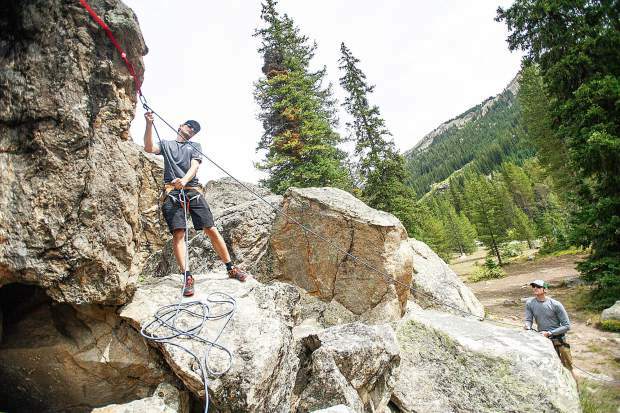 Initially called the “Peak Awareness Campaign,” the idea was to put together a curriculum for beginner and intermediate hikers who want to become climbers and tackle the more technically difficult peaks in the Elk Mountain Range around Aspen. 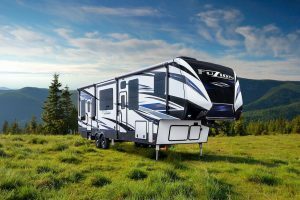 Much of the program’s emphasis was slated for residents of the Front Range, where a significant portion of fourteener climbers reside. MRA partnered with two local guiding services, Aspen Alpine Guides and Aspen Expeditions Worldwide, to develop a 90-minute presentation that covers the basics all climbers and hikers should know before they set out to ascend not only Elk Range fourteeners but Colorado peaks in general. 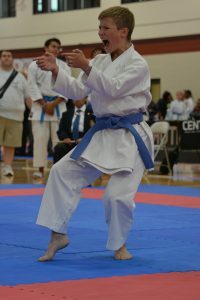 Those local experts presented the seminar six times in Denver, Boulder, Golden and Colorado Springs in June and July. At least one of the seminars attracted about 40 people, while others were attended by maybe 20 people, Hood said. “The turnouts were not great,” he said. 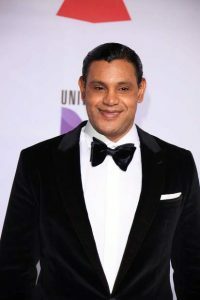 However, Hood said he’s done about 30 interviews with various media outlets in Colorado and nationally that seems to have gotten the word out more effectively. 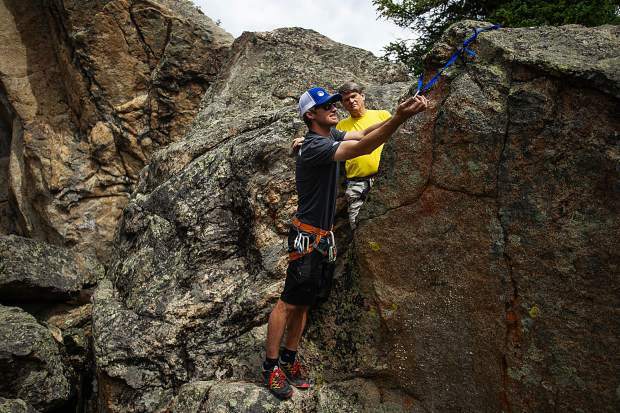 This year’s story of the Aspen area fourteeners has been the polar opposite of last year. The seven deaths in 2017 on Elk Range peaks included five alone on Capitol Peak and two on the Maroon Bells. Another hiker died in the Conundrum Valley after suffering acute altitude sickness. This year, which featured a longer climbing season because the smaller snow pack melted earlier than normal, no one has died so far. Also, the number of search-and-rescue missions undertaken by Mountain Rescue Aspen volunteers has been far fewer, Hood said. MRA took on 57 search-and-rescue missions between Jan. 1 and Aug. 31, 2017, he said. This year, that number was 32 missions. “So, year to date, our season has been much lighter (than last year),” Hood said. Whether the campaign and media coverage of both it and the large number of deaths last year had anything to do with this year’s drastically different scenario is anyone’s guess at this point. But Hood also said it is too early to tell why the difference between this year and last year is so stark. And while he said he’d like to continue the Elk Mountain Range safety campaign, he also wants to do things differently next year. 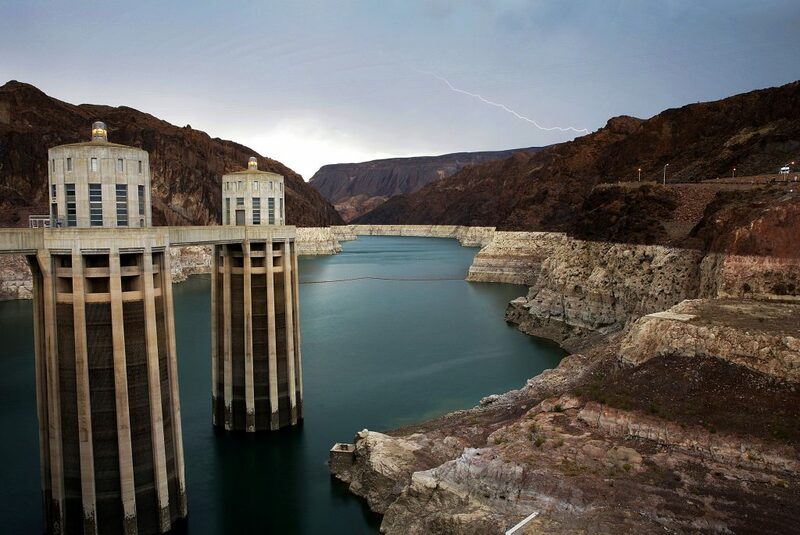 “I don’t think we had the kind of turnout we were hoping for with regards to the actual presentation as well as the one-day mountaineering courses,” he said. 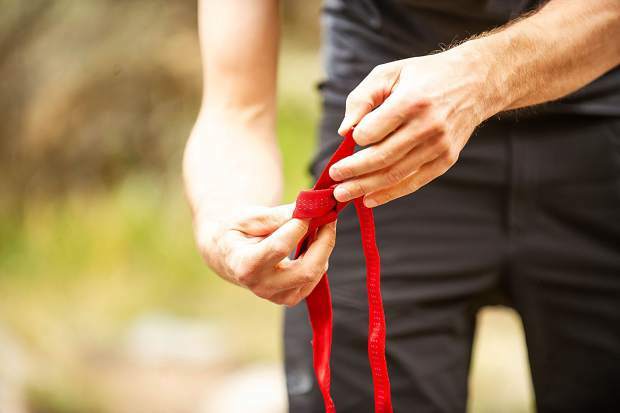 The one-day mountaineering courses — for the subsidized, pretty-good-deal-price of $50 — have only been offered in the Aspen area. But due to lack of interest, just one of four so far has actually happened, Hood said. The 90-minute Elk Mountain safety presentation also has been offered once so far in the Roaring Fork Valley. An Aspen Times reporter attended the 90-minute presentation last month — which attracted about 15 to 20 people — at the Colorado Rocky Mountain School in Carbondale, as well as the one-day course a week later in Aspen. Amos Whiting, co-owner of Aspen Expeditions Worldwide headquartered at Aspen Highlands, narrated much of the presentation in Carbondale. It focused on basic geology of the Elk Range and how to deal with the rock, difficulty ratings for the five main fourteeners around Aspen and how to interpret them; weather and how to read it; risk assessment tools; how to best choose a climbing partner, trip planning and goals; technology assistance and wilderness etiquette. Two main messages emphasized by Whiting and others were that technical, difficult peaks are not hikes, they are climbs and that climbers should never be afraid to call for help. Another was to realistically choose the mountain you want to climb. For example, those without experience in the Elks should not choose the difficult Maroon Bells traverse or Capitol Peak as their introduction, Whiting said. 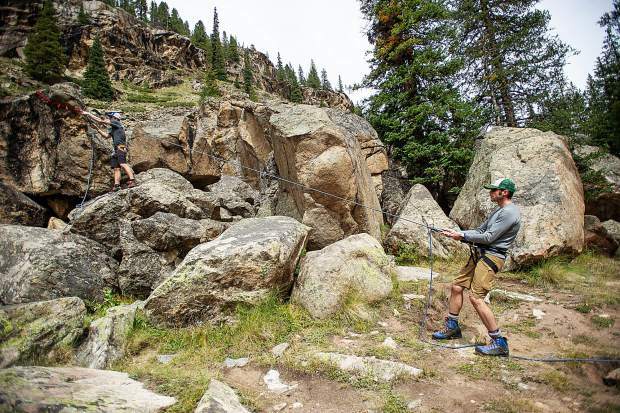 Steve Szoradi and Nate Rowland of Aspen Alpine Guides hosted the one-day class at their headquarters near the Ute Trailhead in Aspen before Newland took the class up Independence Pass for the hands-on portion. The classroom portion was essentially the same information as the 90 minute presentation, but more of it in a more intimate, conversational setting. 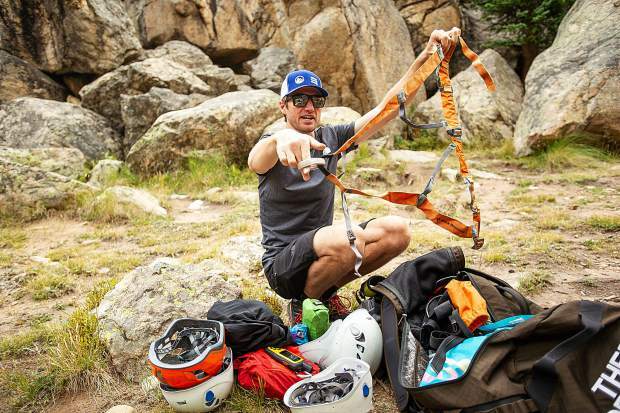 The outdoor portion at a bouldering area up the Pass just beyond the Lincoln Creek Road turnoff was more gear-focused — as in what to carry in your pack and your first aid kit. 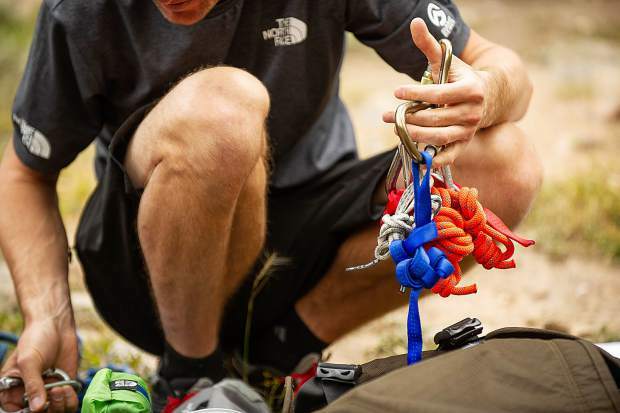 Rowland also spent a good deal of time talking about ropes and how to use them on fourteeners and in mountaineering situations, as well as having participants tie knots and create anchors for climbing or rappelling. The class participants included a retired man from West Virginia who recently moved to the area and spent an unplanned night on the slopes of Mount Sopris with his son, an Oklahoma woman who liked to hike around her second home in Basalt but has trouble finding a hiking partner and an Aspen local with plans to explore more of the peaks in his backyard. Instead of the 90-minute presentation, next year’s version of the safety campaign might include YouTube videos and a different marketing strategy, perhaps more geared toward millennials, Hood said. 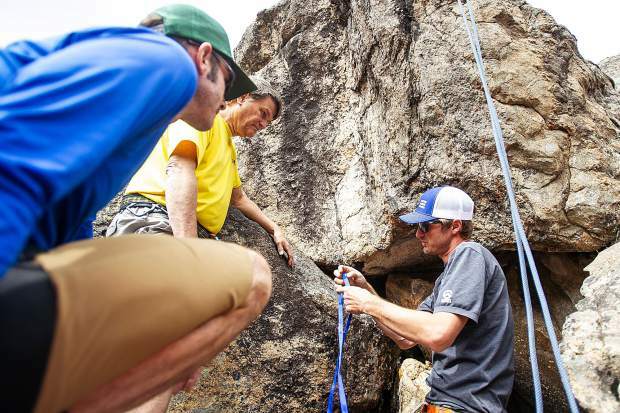 The 90-minute, free seminar will be presented one more time this season at the Mountain Rescue Aspen building on Highway 82 on Thursday from 6 to 7:30 p.m.
Three more one-day mountaineering classes are on the schedule for Saturday and Sept. 16 and 22. Check out the Elk Mountain Range Safety Coalition Facebook page for more information or call Aspen Alpine Guides at 970-925-6618 or Aspen Expeditions Worldwide at 970-925-7625.